On a foggy summer night, eleven people—ten privileged, one down-on-his-luck painter—depart Martha's Vineyard on a private jet headed for New York. Sixteen minutes later, the unthinkable happens: the plane plunges into the ocean. The only survivors are Scott Burroughs—the painter—and a four-year-old boy, who is now the last remaining member of an immensely wealthy and powerful media mogul's family. 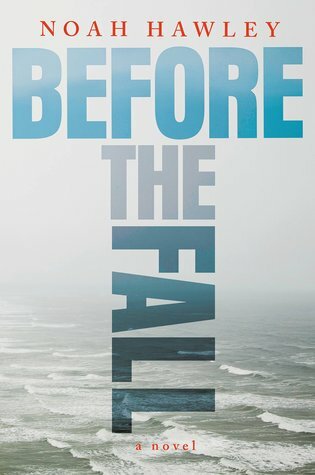 With chapters weaving between the aftermath of the crash and the backstories of the passengers and crew members—including a Wall Street titan and his wife, a Texan-born party boy just in from London, a young woman questioning her path in life, and a career pilot—the mystery surrounding the tragedy heightens. As the passengers' intrigues unravel, odd coincidences point to a conspiracy. Was it merely by dumb chance that so many influential people perished? Or was something far more sinister at work? Events soon threaten to spiral out of control in an escalating storm of media outrage and accusations. And while Scott struggles to cope with fame that borders on notoriety, the authorities scramble to salvage the truth from the wreckage. I have just recently started watching Fargo, the television series, and I have really loved it, so when I heard that one of the producers of that show had a book coming out I knew it would be something I would enjoy. This book has a great mystery aspect to it, what is it that happened in such a short amount of time and caused a huge tragedy. I was intrigued by this story and the background of everyone involved, slowly piece by piece the puzzle is revealed and you get to know each of the characters and their history. I will say that I did have some issues getting through the book, it is a confusing read, there is a lot of back and forth from what brought each character to the plane that day and then back to the events following the crash and the aftermath. There were quite a few times that I found the story hard to follow, also because I put it down for so long and then forgot about things I had read before. I will say that I was more consumed by the chapters that dealt with the aftermath of the crash, seeing how the little boy manages and how those that love him come to his rescue, but also the bond that Scott ends up having with this little boy after saving his life. I really loved Scott's story, he is a very strong character and he is the one who is having the toughest time in the aftermath, why is he the only one who survived? What I really loved is how this story shows the ways people can interpret something so quickly and turn a story so that it works in their favour. Noah Hawley makes it difficult at times for readers to make their own judgments about the characters because they are being thrown at you right from the beginning. This is definitely the type of book that you can't put down for too long of a period of time or you lose the story. And it is one that you need to pay attention to everyone, you can never be too careful of who you meet and the motives they have to harm others. I did enjoy many parts of this book, but just had a lot of issues keeping myself motivated to read it. This is a good mystery book that has so many parts to it, you can't tell if you are on the right track with answers, but at the same time it felt like a little more of a blocking for a television show as well and I think that is what made it hard for me to stick with it for long periods of time. This is the type of book that won't be for everyone but is one that needs a chance because it will be an interesting read.